Does a home Washing Machine Affect the Septic Tank? Can we use a clothes washer or "washing machine" when a home is connected to a private septic system? What steps should be taken to protect the septic system from excessive water use or clothes lint or detergents? How to extend the life of a septic system. 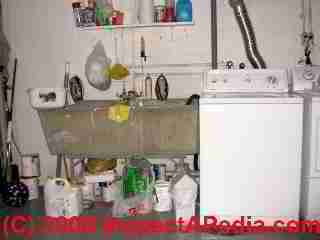 Does a washing machine overload and harm the septic system? The volume of water from home washing machine use should not be a problem with a normal septic system in good working order. Below we discuss steps you can take to minimize the possible effects of extra wastewater loads caused by washing machines, and then we discuss the effects of detergents and soaps when operating a clothes washer connected to a septic system or drywell. Does Washing Machine Detergent Harm the Septic Tank or Septic System Drainfield? The volume of detergent from a residential clothes washer entering the septic system is so low as to be very dilute when it enters the septic tank, dilute enough that it is not going to harm the septic tank bacteria at normal levels of residential dishwasher use. Clothes washing machine detergents do not make a high level of suds inside the machine.They rely on surfactants, high water temperature, and time spent agitating the contents of the clothes washing machine to clean them. However many if not most washing machine (and dishwasher) detergents contain phosphates or nonylphenol ethoxylate surfactants. Surfactants are what make detergents effective in lifting soil particles off of a surface (a dish in the dishwasher or a shirt in the washing machine). These chemicals may be serious contaminants of ground water and surface water in the environment. What laundry detergents or soaps should we use in a Clothes Washing Machine connected to a septic tank or to a Graywater System? Sometimes we find that dry powder clothes washer soap appears as clots and clogs in the system - usually because the homeowner is pouring in too much detergent and is not following the manufacturer's instructions. Passing solid clumps of detergent into the septic tank speed clogging of the system and in severe cases can even block a building drain. at DISHWASHERS vs SEPTICS where we discuss recommended detergents and also the effects of phosphates & detergents on the environment. A private septic system tank and drainfield can be protected from clogging due to excessive use of detergents. And even if a building's wastewater is carried to a public sewer there may be concerns with detergent clogging in the drain system. In the laundry room serving a residential apartment building such as shown in our photo (left, Bronx, NY), asking residents to follow these suggestions can help prevent sewer drain clogging. Avoid using more than the necessary amount of powdered laundry or dishwasher detergent. Excessive amounts of powdered laundry detergent often fail to dissolve in the washing machine. Liquid laundry detergent: Safer if you are not the one operating the clothes washing machine, use liquid laundry detergent. "Budget" powdered laundry detergents contain extra amounts of fillers (in some cases montmorillonite clay) which increase the risk of system drainage or drainfield clogging. Liquid detergents recommended: We prefer to use liquid detergents in the recommended amounts or less in clothes washers connected to or draining into any onsite disposal system, septic tank, cesspool, or drywell. Use liquid laundry detergent rather than a dry soap powder laundry detergent to reduce septic system clogging. Some experts report septic system clogging in pipes, septic tank, and drain field when large amounts of dry laundry soap powders are used. 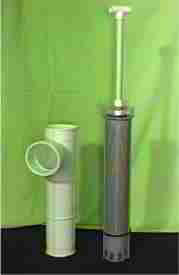 Install a separate drywell to receive water from the washing machine drain, and perhaps dishwasher and other graywater. Spread out use of the washing machine over longer intervals - perhaps washing loads in morning and at night rather than running one laundry load right after another. This "dosing" of the septic system or drywell gives the absorption system time to recover between washes. Cleaning out the septic tank more often than the minimum schedule will extend the life of your drainfield. In turn, this will permit the drainfield to better absorb the extra volume of wastewater generated by clothes washing. Similarly, any other measures that protect the drainfield's ability to absorb water, such as avoiding flooding the fields with surface runoff, become more important if a family is using their washing machine alot. Also see CHEMICALS & CLEANERS into the SEPTIC TANK? Bleach at normal household usage levels should not harm the septic system. Braida, Washington, Say Kee Ong, William L. Smith, and James W. McCabe. "Fate of adsorbable organic halides from bleached laundering in septic tank systems." Environmental toxicology and chemistry 17, no. 3 (1998): 398-403. A study was conducted to assess the fate of adsorbable organic halide (AOX) formed from the use of household bleach during laundering in a septic system. Experiments were conducted using laboratory-scale septic tanks and leachfield systems. Addition of feed water containing 20% of bleached or unbleached laundry wash water did not affect the performance of the septic tanks or the leach fields. Overall chemical oxidation demand (COD) and total organic carbon (TOC) removal rates through the septic systems were in the range of 90%. Adsorbable organic halide from unbleached laundry wash water with concentrations between 0.13 and 0.21 mg/L appeared to be removed in the septic tank but not in the leach field. The average overall AOX removal rate using unbleached laundry wash water was approx. 43%. In contrast, the overall removal rate of AOX generated from the use of sodium hypochlorite in bleached laundry wash water was between 87 and 94%. About one-third of the AOX was removed in the septic tank, and the rest was removed in the leach field. Analysis of the septic tank sludge and the soil in the leach field showed no accumulation of AOX from the use of hypochlorite, and the AOX was most likely removed by biodegradation and/or chemical degradation. Continue reading at WATER SOFTENER IMPACT on SEPTIC or select a topic from closely-related articles below, or see our complete INDEX to RELATED ARTICLES below. Or see WASHING MACHINES & SEPTIC SYSTEMS FAQs - questions & answers posted originally at the end of this page. CHEMICALS & CLEANERS into the SEPTIC TANK? DRUGS INTO the SEPTIC TANK? RV HOLDING TANK DUMP INTO SEPTIC TANK? 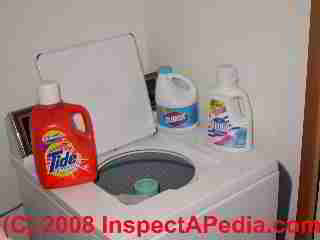 WASHING MACHINES & SEPTIC SYSTEMS at InspectApedia.com - online encyclopedia of building & environmental inspection, testing, diagnosis, repair, & problem prevention advice. "International Private Sewage Disposal Code," 1995, BOCA-708-799-2300, ICBO-310-699-0541, SBCCI 205-591-1853, available from those code associations. "Manual of Policy, Procedures, and Guidelines for Onsite Sewage Systems," Ontario Reg. 374/81, Part VII of the Environmental Protection Act (Canada), ISBN 0-7743-7303-2, Ministry of the Environment,135 St. Clair Ave. West, Toronto Ontario M4V 1P5 Canada $24. CDN. Manual of Septic Tank Practice, US Public Health Service's 1959. Septic System Owner's Manual, Lloyd Kahn, Blair Allen, Julie Jones, Shelter Publications, 2000 $14.95 U.S. - easy to understand, well illustrated, one of the best practical references around on septic design basics including some advanced systems; a little short on safety and maintenance. Both new and used (low priced copies are available, and we think the authors are working on an updated edition--DF. Quoting from one of several Amazon reviews: The basics of septic systems, from underground systems and failures to what the owner can do to promote and maintain a healthy system, is revealed in an excellent guide essential for any who reside on a septic system. Rural residents receive a primer on not only the basics; but how to conduct period inspections and what to do when things go wrong. History also figures into the fine coverage. Water Wells and Septic Systems Handbook, R. Dodge Woodson. This book is in the upper price range, but is worth the cost for serious septic installers and designers. Wells and Septic Systems, Alth, Max and Charlet, Rev. by S. Blackwell Duncan, $ 18.95; Tab Books 1992. We have found this text very useful for conventional well and septic systems design and maintenance --DF. Advanced Onsite Wastewater Systems Technologies, Anish R. Jantrania, Mark A. Gross. Anish Jantrania, Ph.D., P.E., M.B.A., is a Consulting Engineer, in Mechanicsville VA, 804-550-0389 (2006). Outstanding technical reference especially on alternative septic system design alternatives. Written for designers and engineers, this book is not at all easy going for homeowners but is a text I recommend for professionals--DF. Builder's Guide to Wells and Septic Systems, Woodson, R. Dodge: $ 24.95; MCGRAW HILL B; TP; Quoting from Amazon's description: For the homebuilder, one mistake in estimating or installing wells and septic systems can cost thousands of dollars. This comprehensive guide filled with case studies can prevent that. Master plumber R. Dodge Woodson packs this reader-friendly guide with guidance and information, including details on new techniques and materials that can economize and expedite jobs and advice on how to avoid mistakes in both estimating and construction. Chapters cover virtually every aspect of wells and septic systems, including on-site evaluations; site limitations; bidding; soil studies, septic designs, and code-related issues; drilled and dug wells, gravel and pipe, chamber-type, and gravity septic systems; pump stations; common problems with well installation; and remedies for poor septic situations. Woodson also discusses ways to increase profits by avoiding cost overruns. Country Plumbing: Living with a Septic System, Hartigan, Gerry: $ 9.95; ALAN C HOOD & TP; Quoting an Amazon reviewer's comment, with which we agree--DF:This book is informative as far as it goes and might be most useful for someone with an older system. But it was written in the early 1980s. A lot has changed since then. In particular, the book doesn't cover any of the newer systems that are used more and more nowadays in some parts of the country -- sand mounds, aeration systems, lagoons, etc. Onsite Wastewater Disposal, R. J. Perkins; Quoting from Amazon: This practical book, co-published with the National Environmental Health Association, describes the step-by-step procedures needed to avoid common pitfalls in septic system technology. Valuable in matching the septic system to the site-specific conditions, this useful book will help you install a reliable system in both suitable and difficult environments. Septic tank installers, planners, state and local regulators, civil and sanitary engineers, consulting engineers, architects, homeowners, academics, and land developers will find this publication valuable. Onsite Wastewater Treatment Systems, Bennette D. Burks, Mary Margaret Minnis, Hogarth House 1994 - one of the best septic system books around, suffering a bit from small fonts and a weak index. While it contains some material more technical than needed by homeowners, Burks/Minnis book on onsite wastewater treatment systems a very useful reference for both property owners and septic system designers.